It’s pretty clear to see something is not quite right between our Chief Executive and Manager. Lot’s of sniping and cryptic messages in the media and I along with others very much get the feeling Rangers Football Club isn’t big enough for the two of them and something has to give. I also know a lot of the stuff in the media doesn’t have any quotes and you’d think Rangers have just won a title and have a share price to look after. However, today we saw Charles Green according to the press demand Ally sacks assistant Kenny McDowall and coach Ian Durrant which in my opinion is the correct thing to do but not in this manner, not through the media. In fact Ally should be relieved from his duties as well as I mentioned in my Ally Times Up article a few weeks ago. I have already given a detailed list of reasons why I think Ally and the full coaching staff along with scouts should be replaced by someone with a new long term planner and footballing philosophy. Neil Murray of the scouting department was let go from the club last week for reasons we may never know, rightly or wrongly I have no opinion on Murray as there was rumours he did sign the likes of Cribari and Argyriou and there were rumours he didn’t want to sign them and it was Ally’s call. There is too much of a comfort zone at Auchenhowie and a clear out from the bottom to the very top is required to challenge the players and have them progress as players and us as a football club progress in the manner we should. Add to that certain promises that haven’t been delivered such as renaming the training ground, you the know the one Joe Lewis paid for but a certain criminal ex chairman who nearly ended us had the audacity to name it after himself. There is a long list of promises that haven’t been delivered upon and fans have become restless and quite rightly so, I still maintain Green has done a better job than Martin Bain but that wouldn’t be difficult now would it Mr Bain. He may be outspoken but Green isn’t daft, he knows a high number of the Rangers fans don’t think Ally McCoist is up to it as Rangers manager, he will also have seen the drop in crowds at Ibrox in the past few weeks not to mention the number of fans leaving at half time. The game at Queens Park at the weekend was probably the only decent performance in the entire SFL 3 season and add to that the only other Rangers like performance in the 2-0 win against Motherwell in the League Cup it simply isn’t good enough. Season ticket sales are essential in Green’s business plan and he knows the fans expect as a bare minimum a good attacking team that wins football matches, not sides setup as a 4-5-1 with two anchormen against the big bad superstars of SFL 3. A lot of people seem to be jumping the gun and comparing Charles Green’s time at Rangers to his past employment at Sheffield United, I’m certainly wary of it but its unfair to jump in too soon on this matter as we all know what the media are like in this country especially after we won the big tax case. 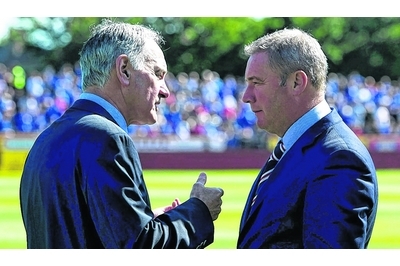 I hope I’m not alone in noticing all these stories about Rangers, Ally McCoist & Charles Green being negative, not to mention the recent stories of the biggest liar on the planet…well he was until The Sun aka the worst excuse for a paper on this planet deemed him as ‘factual’ with ‘evidence’ that as usual led to them looking stupid.